Now, I have two completely different things I want to talk about at once, which explains the completely different lyrics. Next up – I really, really hate being misquoted. So on my sister’s Facebook page, she claimed that I had accused her of torturing fish for catching them to eat. I said nothing of the kind. I accused her of torturing fish because she does not eat meat; she engages in catch and release. For the uninitiated, that means that she throws out a hook which catches the fish in the mouth, drags the fish out of the water so it can’t breathe, removes the hook (which sounds like it feels about as good as getting the hook caught to start with! ), and then tosses the fish back into the water. Sounds like a step above waterboarding terrorists to me. If she was doing it because they were going to eat it, if she was doing it because they were hungry…if she was even doing it to share with someone who was hungry, I’d be all for it. I don’t care that her husband hunts because he is killing his food; he gets a deer, he eats deer. He gets a duck…well, we’re all surprised. But to get back to the point – so my sister posted that, and I corrected her, and then one of her friends is all, “wow, didn’t mean to start a family argument.” What? No, I simply corrected her. And the problem is…I hate being misquoted. Or not quoted at all. Years and years and years ago (god, I’m so old! ), there was a strike at my high school. My sister and I (see, I give credit where credit is due) called a bunch of friends and asked them to call friends and made up poster boards with writing and showed up at the high school the next morning with signs and had our own little strike against being forced to go to school when there was no school – all we had was substitutes who made us do stupid worksheets, and if we dared to miss school, we would be “in trouble.” Anyway, long story short – idiot reporter showed up and interviewed two guys who were also idiots, and then a story came out in the newspaper about these two guys who started a strike. What?! But that was years ago, and I have to give up my whining and complaining about that. However, I can still complain about current misquotes. Or should I just give that up, too? So maybe it’s more of beating a dead horse, but hey, it’s all deceased mammals with four legs. Now, you may be asking yourself, what does a stiletto have to do with Steak ‘N Shake, that normally awesome place to get a cheap burger and fries with some good milkshake. Well, let me tell you a story. So my birthday was earlier this week, but it was in the middle of the week, and so we decided to go out to celebrate it on Friday. Seemed logical. We decided on hitting the Steak N Shake out in Pearland because there was a movie theater right there, so we could eat and see Judge Dredd. We got to the “restaurant” an hour before the movie. Should be plenty of time, right? Wrong. Because right after we got there, a whole busload of students from some sport (volleyball? softball?) also pulled in and they went to the “to go” line. Still shouldn’t have been a problem. But apparently they were understaffed, both mentally and physically. It took a few minutes to get seated because no one was clearing the empty tables. They just sat there, drinks and other detritus still waiting. So eventually they cleared one and seated us. Yay! We ordered our food and our shakes. Ten minutes, we got our drinks. Meanwhile, half the team had been served and were standing around, eating. Thirty more minutes, and the table next to use – who had been seated and ordered long before we got there – stood up and left. Hmmm. The movie was coming up, and the food was nowhere to be seen. But the team had *all* been served, including the coach who had been last in line, and they were happily finishing their food. While we waited, ignored. Forty minutes of sitting and waiting. Nothing. On our way out, we ran into a couple who told us that they had gotten there 30 minutes before the team, and they had been served as we walked in. And their food was cold. And no one cared. So we went to see our movie (not a bad one, for those who like Dredd and ultra-violence in slow-motion). But here’s the other thing. In the parking lot, when we got there and when we were leaving, we saw a van. It was “Stiletto Steppin.” We had to know what it was because, really, if you saw that in a parking lot, wouldn’t you want to know, too? Apparently, CW39 had a recent “news” piece on them. And just like I’m not willing to call Steak N Shake a restaurant (don’t restaurants normally serve food to customers? ), I can’t call this a news piece. It starts off by saying, “Women are nuts about their shoes. They’d literally fight for them.” Literally fight for them. Yup. A “news” article is telling me that I would fight for my shoes. Not bloody likely, “news” channel! I’m not gonna lie. I like shoes. Totally like them. I buy them. I wear them. But fight? Only if the prize was $10,000 or a full-ride scholarship. Not a pair of stilettos decorated with rhinestones and other novelties. I love the idea of a woman starting her own mobile show business. That’s pretty cool. I wouldn’t mind it if every business became mobile, in fact – that could help fuel our obesity epidemic. But the reporting on the business? The part where the owner of the shoe van, Shawn Bassett, spoke was interesting, and I could see how it would be a good business model. The article itself? Horrible. Regardless, to get back to the point of this blog – Steak N Shake in Pearland? Boo to you! Dredd? Yay! Shoe van? Interesting. Reporting as per CW39? Boo to you, too! All in all, a pretty interesting evening out that resulted in me having a headache from having a shake for dinner and getting all annoyed with two different places. Hopefully next year’s birthday will be a bit better. 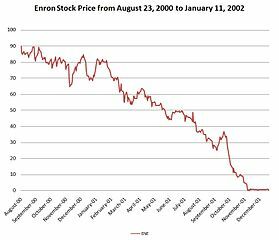 A line graph of Enron’s stock price (in USD) from April 23, 2000 to January 11, 2002. Data compiled from Enron Securities Litigation Web Site. Created by Nehrams2020 and licensed under Creative Commons 3.0. Yes, that’s always been true, and more true for some than for others. Popes who fathered children. CEOs who raided stock before departed for bigger and better things, leaving 401k plans in the dust. But college professors who are “proudly unethical,” writing essays for students? Yup, it’s going on right now. Thanks to a recent Gawker article, I got another lesson in what other people think. The article itself isn’t that amazing. 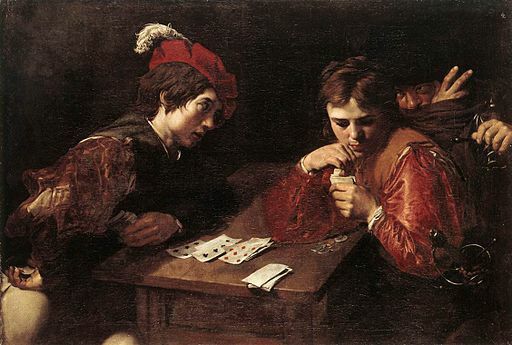 Like I said, there have been plenty of unethical people throughout history, and it kind of makes sense for academics to write academic papers. Logical. But totally, totally wrong. Well, hell, if ethics is optional, why am I paying my bills at all? Why work? I can forge forms showing I have a disability. I mean, obviously, I don’t belong working at a – gasp! – Subway! Only the lowest of the low would do that. And…bigger gasp…raking leaves! Manual labor? For someone with a degree? Now that’s even worse than having ethics! Seriously, what is wrong with this world when we think we’re entitled to do something “where we fit in.” Who determines where we fit in? And, keep in mind, I write this as an underemployed college professor who works part-time at two colleges to earn less than a full-time professor but has to teach more classes and has less support. And I still would rather hang on to my ethics and not be “where I fit in.” And if I had to work retail, I would. And if I had to rake leaves, I would. Because I’d rather have a job “below” me than discover that I compromised what I’d learned and what I believed in. I have to wonder if “SadDave” has a college degree, and how honest he was in getting it. And I also have to wonder…did “SadDave” ever take a critical thinking class, or perhaps one on ethics? Because obviously he deserves his money back on both of them if he did. Yesterday I made a fascinating revelation: running on a treadmill is not the same as running in a real neighborhood. The pavement doesn’t feel squishy and bouncy under my stride, it’s a lot hotter without the air conditioning, and there are a lot more cars. Plus there’s no handy resting place for my phone and water bottle. My prep at the gym, while it feels good, isn’t quite setting me up to run a 5k as well as I thought it was. Which reminds me of a funny parallel. Substitute teachers are not the same as full-time teachers. Especially when it comes to filling in during a teacher strike. Now, before the complaining and attack begin, please don’t think I’m busting on substitute teachers. And long term subs who do a month or half year or whatever else don’t count either. I’m specifically talking about teachers’ strikes and substitutes. And I know what I’m talking about. Many a year ago, when I was at the bastion of totally crappy education, Columbia High School, there was a teacher strike. We, the students, were told that if we didn’t go, we would get “chargeable absences” (which, ironically, is what made me drop out, but that’s another story for another blog). Anyway because of the intelligent decision of the administration, we wound up in classes that weren’t classes. We did word searches and crossword puzzles. We took standardized tests, sort of. You know the kind, the good old-fashioned “read this passage and then answer these multiple-choice questions.” Boring. Waste of time. Sure, maybe those substitutes had something to offer, but they didn’t offer it to us, and there was no certainty when the strike would end or when we’d actually do something for course credit that was related to the course. The strike in Chicago schools just reminds me that while it’s okay to offer students substitutes, there is value in teachers. Teachers are worth what they’re asking. You can’t just give students substitutes and expect them to learn, anymore than I can practice jogging on a treadmill and expect to run a 5k on actual roads. My youngest nephew just turned 19. He’s off at college. He’s had 2 jobs, neither of which lasted very long, and he seems to me to be rather unprepared for responsibilities and the real world. But he’s not alone. The more teenagers I meet, the more I realize how growing up has changed. At the age of 19, I’d been out of high school for 2 years, having dropped out at 17 and gotten my GED before the rest of my class had graduated. I was working a full-time job and paying for my own car and insurance. I was still living at home but only because I couldn’t afford an apartment at NJ prices, but I was engaged and planning on moving out. So, yeah that was a whole bunch of years ago, I have to admit. And times have changed. But what’s made them change? My own change in socio-economic status that college a norm for teenagers? The part of the country I’m living in? Or is it a legitimate change across the board? Are we not requiring the right things from our children? Are we not allowing them to mature? Are we taking away their sense of responsibility and replacing it with a sense of entitlement? Lots of questions, and not many answers. But I do wonder if even just the little changes are having big effects. (No mention of the butterfly effect, I promise. Damn! There it was!) For example, at my son’s school, kids aren’t just dismissed willy nilly like when I was a kindergartner, forgotten on the steps because the bell rang and my sister walked home without me. No, today kids have to be picked up. Parents wait in massive lines, creeping up in their cars, ready with their yellow taxi hang tags that announce their child’s name and grade. Even children who are walking home have to have a parent show up with a photocopied shoe to prove they can walk home. Everyone gets awards for something. No one loses at Little League. But that’s okay. Because in the front hall of the school is a fine selection of pamphlets that give great advice on studying, learning disabilities, and how everyone can be smart in their own way. And we took three of those pamphlets, wrapped them up, and mailed them to our nephew. And nestled in one of them is a note. And that note says that if he finds the note and emails us, he can have $20. So let’s see if he’s “responsible” enough to read them. So a few years ago, The Chronicle of Higher Ed published a “confessional essay” from a guy who wrote papers for students and had spent almost 10 years “helping college students cheat.” He’s now written a book (really? Can we even trust that he wrote it himself??) about his years as an “academic ghostwriter” – a doublespeak euphemism if I’ve ever heard one! Well, Mr. Tomar of the bachelor’s degree who is so brilliant and such a master of writing…I care. I currently teach at a for-profit, and I don’t just care if work is completed. I care if it’s good. I take time out of my schedule to call my students. I give them feedback. I hold office hours, even if no one shows up. I do the same level of work I do at any college or university. I don’t deny that some teachers – and some schools – don’t care. One school that I refused employment at (note what I said – I quit before training was done when I saw what they expected) thought that no one should fail for plagiarism unless it could be proven that they bought the paper. 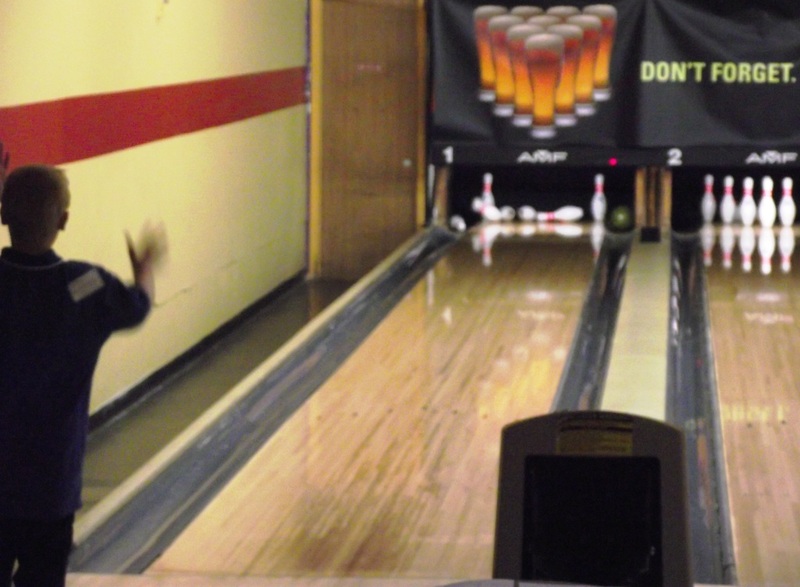 Otherwise, as instructors, we had to let them re-do the work. When I questioned it, someone was supposed to call me. No one ever did, and I resigned from the training. There’s a difference in writing papers and learning, and I don’t think that Mr. Tomar learned that while he wrote all the psychology papers for his PhD client. Maybe he understands himself, but he doesn’t understand education. The irony, however, is that today, the day that I write this, is International Literacy Day, September 8. The UN proclaimed it, the International Reading Association is happy about it, and there is a huge push to get people literate. Yet kind people like Mr. Tomar instead helped to stop that literacy. He took money to help people get degrees they didn’t deserve, and he helped them get stuck later on in life. Sure, they got the degree. But what happens when they get a job and get fired because they’re incompetent at reading and writing? He did worse than the system he blames. The system may have failed to catch the cheating, but he actively sabotaged their lives. I hope he can sleep at night, knowing that he’s earning money from writing a book that his “clients” can’t read. Is buying a book review any different than buying a research paper? On one hand, yeah, it’s totally different. It’s a book review! It’s not being submitted for a grade. But…those seem to be the only differences. In both cases, it’s someone lying. Someone misrepresenting the truth. Someone attempting to fool a reader. Someone trying to pull the wool over someone else’s eyes. Where does this cheating come from? Because, let’s be honest, it is cheating. It’s an attempt to fool someone into believing something that is not true and for someone to take credit that isn’t theirs to take, whether it’s taking credit in a class or taking credit for a “good” book. Book reviewers charge more for better reviews, and people who write papers are happy to do so for whatever grade or standard the paying student wants. How crazy is it that people think these things are okay? What has gone wrong with the world? Or has it not changed, only changed mediums? Think back to the days of snake oils and confidence men. We have movies (The Sting) and musicals (The Music Man) that actually teach us that this trickery is a skill and requires charm and confidence. It’s all positive attributes. Something to be admired. Good business sense. And it is good business sense! Selling book reviews is lucrative as is writing papers for students. So does that make it okay? Again, I say no, and from the outraged generated from the fake books reviews and the article written by one of the (anonymous) paper writers, it’s clear that I’m not alone in my attitude. So where did our ethics go? Or did we never have them?